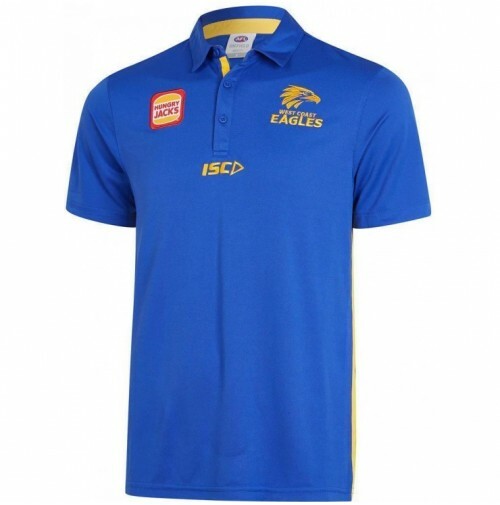 This West Coast Eagles 2019 Men's Media Polo is perfect for wearing when watching a game or for everyday occasions. The polo is designed with comfort in-mind and features embroidered logos on the chest. The polo has been created by ISC and is worn by West Coast players at media appearances during the 2019 season. The polo's design includes the button up collar and uses contrast colour paneling and piping to complete the look. The polo has been constructed using 100% Polyester with revolutionary Bamboo Charcoal Yarn to keep you cool and comfortable during intense game moments. The polo features spliced in micromesh sections to assist with ventilation and breathability.